Nutmeg... putting a little spice in your life! Looking for some exotic flavor? An escape to paradise? Live out your dream of the ultimate getaway aboard Nutmeg and put some spice in your life. 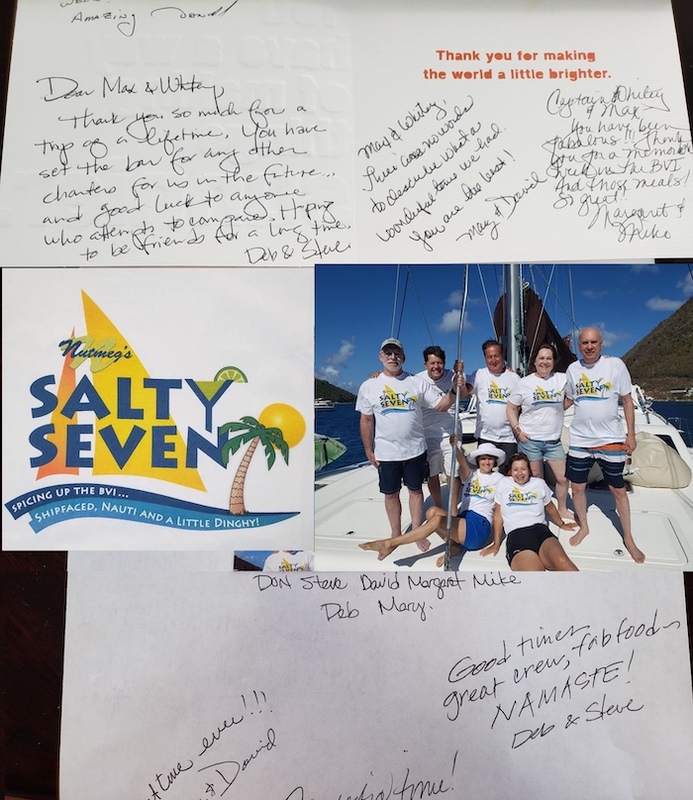 Let Nutmeg and her crew sail you throughout the secluded islands, islets and cays of the BVI archipelago and other beautiful Caribbean islands. Discover white sand beaches, offshore reefs, famous shipwrecks and emerald green mountains. Enjoy your dream vacation sailing on a luxury catamaran to beautiful islands, enjoying tropical drinks, gourmet cuisine and beautiful sunsets with your favorite people. Max and Whitey (Maxine and John White) have a long history in the charter industry. Whitey is originally from Perth, Australia and Max from Utah but they have made ‘the Caribbean’ their home. After arriving on their cruising boat in 1992 to get married at Cane Garden Bay, they began their chartering career. They have hosted guests on large catamarans in the Virgin Islands, down the island chain and even a few years of ‘adventure chartering’ in the San Blas Islands of Panama and in Belize. The most recent years have been on a private yacht exploring the Dominican Republic, Jamaica, Cuba and Belize. They are excited to now be returning to the beautiful British Virgin Islands where chartering began for them. Captain Whitey takes the helm as he sails you around the islands. He knows all of the anchorages intimately and will customize the itinerary to the guest preferences. He is known as the entertainer and his primary goal is to make sure his guests on Nutmeg have the best vacation in their life. He holds a RYA Yacht Master Ocean license and has been a PADI Dive Instructor for 24 years. Whitey has a passion for teaching, whether it be snorkeling or scuba diving, or introducing people to anything regarding life on a boat. At night you can expect more entertainment with interesting ‘Whitey stories’ of his many travels while being served his original and classic beverages from the bar. Originally from the land-locked state of Utah, Maxine had never been sailing until she met Whitey in San Francisco. She quickly took to it and before long she quit her job in the San Francisco Financial District to sail away under the Golden Gate Bridge with Whitey. Many sea miles later they were married at Cane Garden Bay, Tortola. Max has since completed over 45,000 blue water miles. First Mate and Chef Max brings her years of extensive traveling to inspire her meal preparation on Nutmeg. Max likes to use local and fresh ingredients and her primary culinary specialties are Latin and Caribbean as well as Asian and Mediterranean cuisines. In past charter boat shows, she has won awards with her Tamarind Duck! Max is also an avid diver as a PADI Dive Master for over 20 years. She especially likes to show her guests the underwater world and knows the best of the snorkel spots in the BVIs. While sailing on a Nutmeg charter you can expect to have a specialized and relaxing sailing vacation! - Certificates Culinary Institute of America, United States Personal Chef Assoc. NUTMEG can accommodate 8 guests in 4 cabins. 3 Guest cabins have a queen size bed, shower and toilet. NUTMEG is fully air conditioned through out. Award Winning ‘Tamarin Duck Breast’ with Tamarind-Grand Marnier sauce. Max and Whitey: there are no words to describe what a wonderful time we had. You are the best! Captain Whitey and Max: You have been fabulous! Thank you for the memorable week in the BVI. And those meals! So great! Dear Max and Whitey: Thank you so much for a trip of a lifetime. You have set the bar for any other charters for us in the future.. and good luck to anyone you attempts to compare. Hoping to be friends for a long time. Captain Whitey arrange for a taxi from the airport and met us at the dock. My husband is a recent amputee. Captain Whitey and Max took him snorkeling and diving for the fist time since his foot amputation. Comments-was the boat comfortable: Every thing exceeded our expectation. Comments-captain: Captain Whitey and Chef Max were FABULOUS. Please describe the meals: PERFECTION!!!!! Everyday was a wonderful surprise. Emphasize more how great Captain Whitey and Max are to their guests. It was possibly our best vacation! Certainly it ranked right up there. Whitey and Max are really a special crew, really great people with whom we all bonded very quickly. They go out of their way to make everyone feel at home in their home. We all loved it and thank you so much for gently nudging me to choose them. January, 2011We have such great memories of our trip. Thank you so much for making the trip so great. December, 2010We had such a great time. Thanks to all of you for making it so special.Even the boys agreed that it was one of our best vacations! February, 2010You guys are definitely the greatest !!! Please know that our experience with you on our charter vacation is one of the finest experiences I've had in my lifetime [and I've had the opportunity to do a lot. I thank God for our 6 days with you guys and for having had the opportunity to meet each of you. I can't tell you how many people have inquired of us about our experience. Of course everyone is envious. Margie tells everyone " on a scale of 1 - 10, this trip was a 15.